The way I have interpreted this is that I want a mean as close to 1 as possible for the whole array, and a standard deviation as close to 0 as possible for the whole array. Question: How do I combine the mean and the standard deviation in a meaningful way to show a score for "how close" my array is to the goal. The array can be any size. This plot shows several common loss functions for target 0. Their choice depends on your goals. 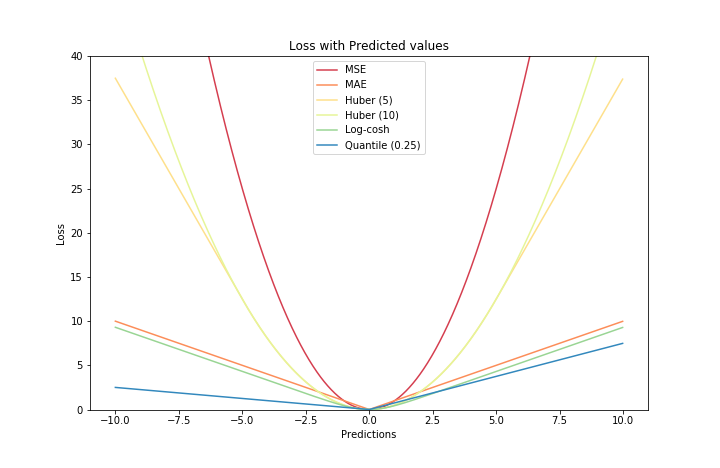 MSE (mean squared error) grows steeply, which in your case means that any numbers far from 1 will be "punished" badly: $[0.7, 1, 1]$ will appear worse than $[0.9, 0.9, 0.9]$. MAE grows slowly and would mark both of these examples as equally close to target. Calculating mean is equivalent to using MSE, because both are based on squared difference between points. If your numbers have a lower bound of 0, you might want to consider some asymmetric function: maybe log-transform them, and then apply MSE, so that 0.1 and 10 would incur equal loss? taking decisions: how to combine scores from different systems? Why does Mean deviation = Standard deviation = Range/2?